A controversial rapper who has been given a record deal by Eminem has been voted the artist most likely to make it big in 2003 in a BBC News Online survey. Almost 40 UK-based music critics, broadcasters and opinion-formers were canvassed to compile a top 10 of hotly-tipped new bands, rappers and singers. The winner, 50 Cent, has been a star of the underground New York hip-hop scene for several years and is expected to explode into the big time after signing to Eminem's Shady Records for a reported $1m (�630,000). Up-and-coming artists from across the musical spectrum and around the world have been uncovered by the survey's top 10. Rock bands Electric Six, Yeah Yeah Yeahs and The Thrills were near the top of the list, and the highest UK act was unsigned garage MC Dizzee Rascal, in fifth place. 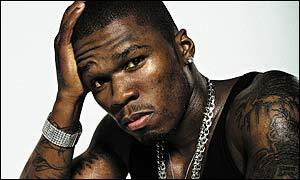 50 Cent was once the prot�g� of former Run-DMC DJ Jam Master Jay, who was shot dead in October. The rapper has been described as more controversial than Eminem, and the pair have been working with Dr Dre on 50 Cent's forthcoming album. "It feels great to know I'm on top of the list," 50 Cent told BBC News Online. "It feels good to know that people appreciate the music." 50 Cent has been attracting attention for his tracks on the 8 Mile soundtrack, with one tune going to number one on BBC Radio 1Xtra's listeners' chart. 1Xtra presenter Derren Lawford said 50 Cent was likely to become the scourge of parents around the world. "If they thought Eminem was annoying, when they hear 50 Cent they really won't be very happy at all," Lawford said. "He does almost nursery rhyme-like rhymes. But the lyrics are nothing like as sweet or as nice as a nursery rhyme." It would be "very hard" to ignore him next year, Lawford added. Another expert to tip 50 Cent was Shurwin Beckford, channel manager of MTV Base, MTV's urban music station. "50 Cent is currently the name on everyone's lips on New York's hip-hop circuit, anticipating the release of his album," Beckford said. "By the end of 2003, he's sure to be worth more than his name suggests." In second place on the list were Detroit rock group Electric Six, whose new single Danger! High Voltage features The White Stripes singer Jack White. New York garage rockers Yeah Yeah Yeahs were third, while Irish band The Thrills came fourth after winning fans in Bono and Morrissey. Dizzee Rascal, rapper with east London garage collective Roll Deep Crew, came fifth after being championed by 1Xtra. What do you think of the bands in the top 10? Should 50 Cent have won, or are there better artists who missed out? I think that 50 Cent deserves the recognition. He's the best thing to come out of the rap scene for a long time. These lists are always likely to be self fulfilling prophecies. The people who have identified 50 Cent are the same people who will be able to give him maximum exposure in 2003. The really interesting artists are those who would never appear on such a list - who'd have predicted the emergence of David Gray at the beginning of 2000? An artist who deserves recognition is Damien Rice, whose electrifying live performances are likely to win him a following next year. Being 'the youth' I really should know more about this sort of thing, but I only know six of the artists on that list, which makes me wonder where I might have been buried all year? Dizzee Rascal, another talentless face with Nike American headgear working the "persecution" thing to the max for the younger generation. Dizzee Rascal is heavy man. Bare talent at just 17, but there are FAR BETTER MCs out there underground right now. Believe me, RollDeep gonna blow up. I agree that 50 Cent is gonna be big, but can you all remember what happened to Sean "Puffy" Combs protege, Shyne, he was signed to BadBoy Records for �1Million and the next thing you know it has gone to his head and he was jailed for attempted murder. Now that 50 is a celebrity he must make sure that he doesnt attempt to use this to escape from the law.